Canadian Solar is a leading global manufacturer of solar modules in 90 countries. With over 32GW of solar modules deployed around the globe since 2001, Canadian Solar is at the forefront of solar cell technology. Canadian Solar continues to invest in research and development, recently launching a new panel as part of their Super High Poly-Perc range. The HiKu 330W split cell solar panel reaches one of the highest poly module power outputs in the solar industry. Combining superior technology and design, the panel produces up to 24% more power than conventional panels and offers better shade tolerance, increased reliability and higher performance in hot conditions. Thanks to the innovative split module design and dual cell technology, the HiKu solar panel has better shade tolerance, decreasing losses by up to 50%. As demonstrated in the diagrams below, when one string of a standard panel is shaded you lose a full third of the panel's production ability. 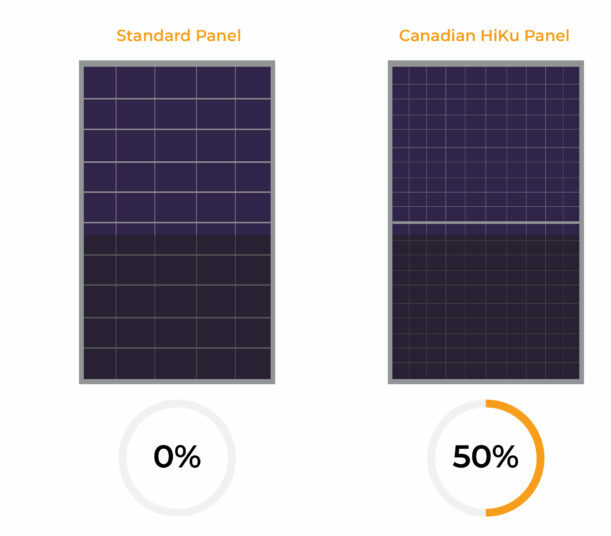 However, when a Canadian Solar HiKu panel is partially shaded, more surface area is still able to produce electricity. 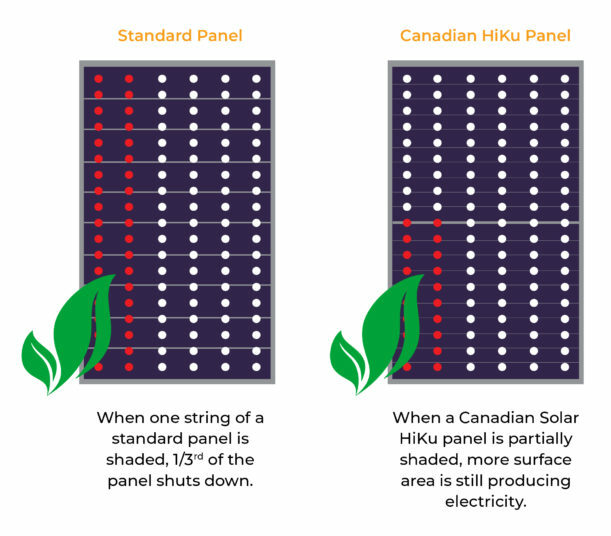 Similarly, if all strings on a standard solar panel are shaded, the panel can not produce any power, but in the same conditions, the Canadian Solar HiKi panel can still produce at 50%. 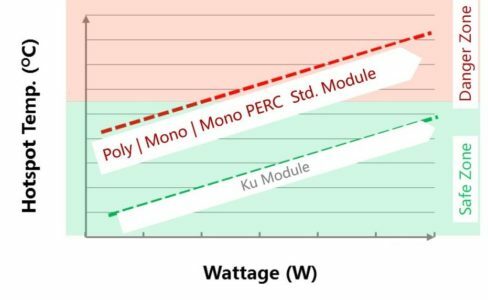 The 330W panel has a module efficiency of 17.84%, a 24% increase in efficiency compared to conventional panels. Rather than using 24 x 275W solar panels to achieve a 6.6kW system size, only 20 x 330W Canadian Solar HiKu panels are required. Ideal for those with limited roof space. The HiKu solar panel is considered a LIC (Low Internal Current) panel. This is beneficial as the lower internal current leads to a lower hotspot temperature. Hotspot temperature occurs when there is one low current cell (usually caused by partial shading such as a bird dropping) in a string of several high current cells. 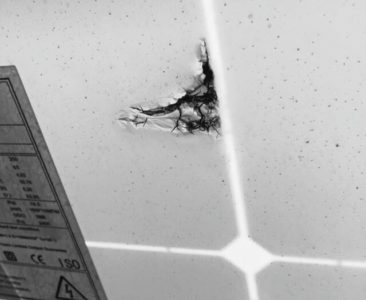 The shaded cell creates an electrical traffic jam of sorts, resulting in a hotspot which can then lead to cell cracking and damage to the solar panel back-sheet. The HiKu 330W panel effectively reduces the risk of this from occurring by having a lower internal current that is spread amongst the multiple strings of cells. The panels also reduce cell crack risk in small regions due to their split cell technology. By having a cell cut in half, you reduce the area for a micro-crack to spread. The utilisation of split cells also means an improved temperature coefficient of the HiKu 330W module (-0.37%/degC). A solar panel’s temperature coefficient refers to how much the power output of the solar panel will decrease due to increases in temperature. This means the HiKu solar panel will lose 0.37% of its power for every degree the cell temperature rises above factory flash test conditions. The industry standard for solar panel temperature coefficients is around -0.4 - 0.5%/degC. Producing higher yields at higher temperatures makes HiKu panels an ideal choice for Australian conditions. 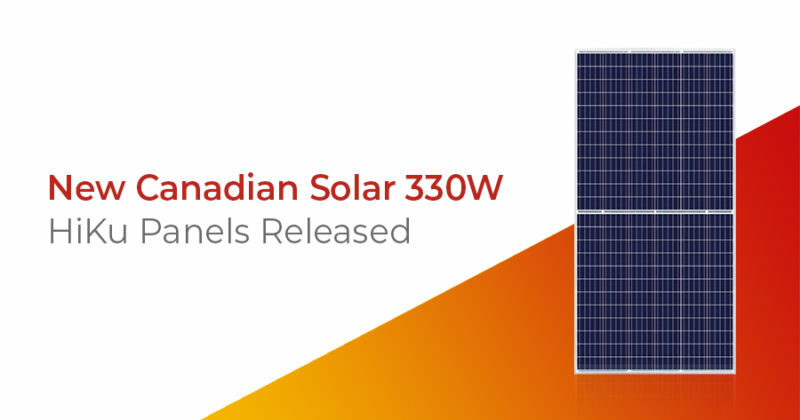 If you’d like more information on the Canadian Solar HiKu 330W panel, or would like a free, no obligation quote, please contact us today.